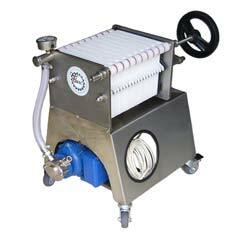 These plate filters work with cellulose filter pads or papers put between the plastic plates. 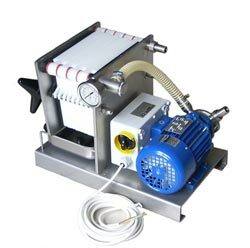 Using these equipments is possible to realize the filtration of oils as olive oil, oilseed, vegetables oil, etc. etc.. The operation consists in removing sediments, residue and water by using the right kind of filter pads or papers (there are many kind of porosity grade) in relation with kind and condition of oil. At the end of filtration we will have a coarse or refined/polished oil. 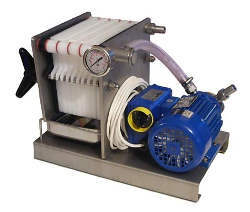 These plate filters - made in stainless steel - are provided with self-priming coaxial electric pump (stainless steel AISI 316) with nitrile impeller, manomether for controlling the pressure and a valve for the regulation of entrance flow. 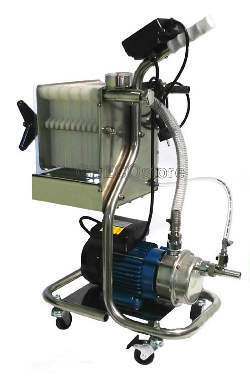 PLATE FILTER "CRISTAL PRO OIL"